Maria Yacaman Baez (BS ’15, MISM ’15) is just your typical top-of-her-class, dual-degree-earning, second-language-speaking, non-Mormon-BYU-student golfer. She notched the top GPA of BYU student-athletes, all while competing as one of BYU’s top four female golfers—and while knocking out both her bachelor’s and her master’s. 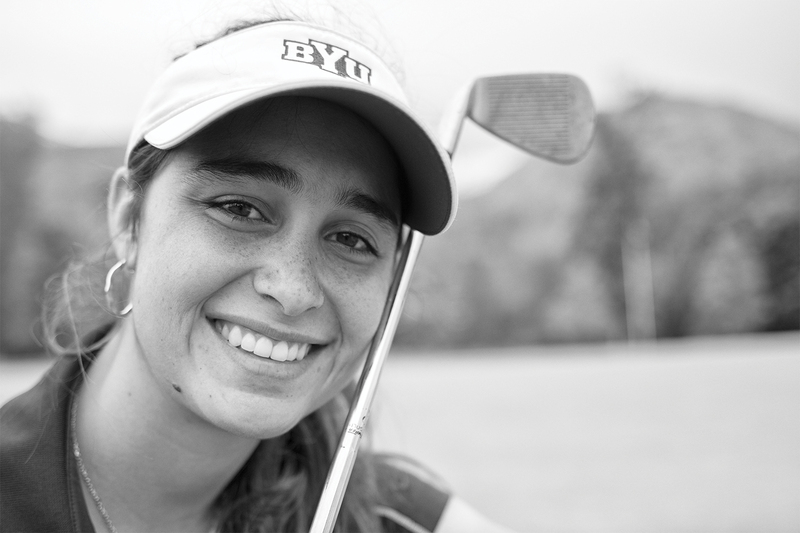 Columbian golfer Maria Yacaman managed the top GPA of all BYU athletes. Photo by Bradley Slade. Born in Colombia to golfing parents, Yacaman was competing by age 9. She represented Colombia internationally, taking third at the U.S. Junior National Championship and claiming a South American Amateur Championship title. But Colombian universities don’t sponsor sports, and Yacaman wanted to study and play—so she teed off at BYU. The golfing champ with a 3.98 GPA (her only A- came in Book of Mormon, and she is not a member of the Church) sums up her schooling and her game simply: “I want to be legit in both.” Which means she is a pro at time management. Juggling class, homework, presentations, practice, and tournament travel, Yacaman is judicious with her time: “She plans it out—even to the bathroom breaks,” says women’s golf coach Carrie Margaret Roberts (BS ’04). No amount of time is too short to be productive, says Yacaman. “If she has a moment, she’ll start reading off her phone,” says teammate Lea Garner (’16). All of Yacaman’s textbooks are on the device, and, adds Garner, most of its pictures are of class slides. The actual books come out the moment Yacaman gets in the car for travel, when teammates catch up on sleep. That’s not to say it’s all work and no play; Yacaman is just 100 percent devoted to the task at hand, be it homework, golf, or socializing. “She’s very in the moment,” says Hilary N. Hayes (BS ’10, MISM ’15), Yacaman’s master’s thesis partner. She worked hard and gained admittance to the joint bachelor’s-master’s IS program, despite its 40-percent rejection rate, and brought a touch of Colombia to the competitive business school: “We’re all about collaborating and friendship. I help you be better, and then I can be better,” says Yacaman. With an emphasis in computer security and forensics, Yacaman’s dream job, “CSI on a computer,” doesn’t seem far-fetched—she landed a computer-sleuthing job in San Francisco at KPMG, an audit, tax, and advisory firm.